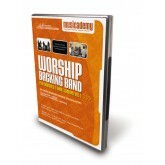 Worship Backing Band Volume 1 is a single DVD featuring backing tracks for 35 contemporary worship songs with on-screen lyrics and fully mixable vocals. This means that you can set the vocals at zero all the way up to full depending on whether you have a confident lead singer yourself. Please note that the tracks from the DVDs cannot be downloaded or played in the Worship Backing Band MultiTrack Player. See our MultiTrack Pro Wav Tracks to play in the Player. Buy it here with a 100% satisfaction moneyback guarantee. All these songs are also available as individual "SplitTrack" video downloads. Its a lot more expensive to buy them individually so if you're looking for best value - the DVD is the way to go. No worship band or are you the only musician? 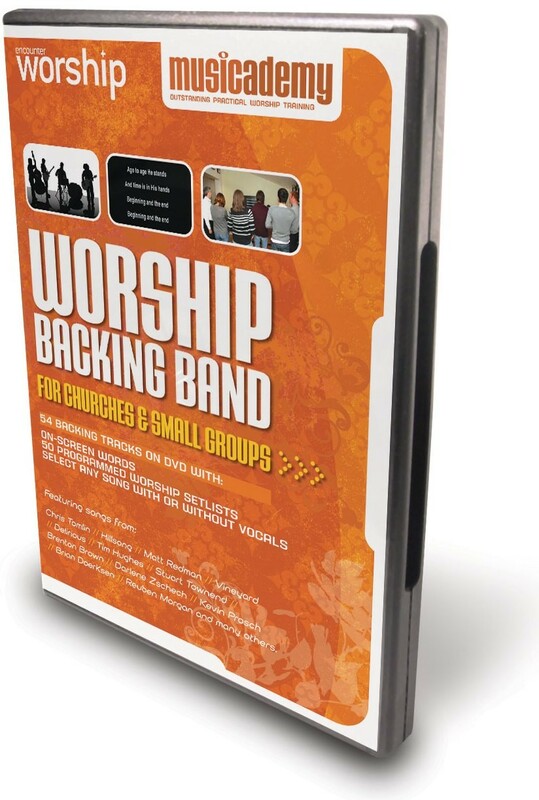 54 backing tracks on DVD with on screen words for churches and small groups to use in corporate worship times. Includes many of the best modern worship classics and upcoming new songs recorded in easy to sing keys by world class musicians. Select any song with or without lead vocals with a simple to navigate menu system. Or choose from 55 pre-programmed worship set lists grouped into themes including: Thanksgiving, communion, hope, personal renewal, exhortation to worship, prayer, personal dedication, healing, the cross, communion, loving God, intercession, forgiveness, gentle songs, proclamation, God's greatness, God's love, God's faithfulness, repentance, revival, thanksgiving and waiting on God. Plus thoughtfully chosen long and short set lists to suit different ages, styles and demographics. All in easy to sing keys with easy to read words on screen. Featuring modern worship classics plus upcoming new songs from Chris Tomlin, Hillsong, Matt Redman, Vineyard, Delirious, Tim Hughes, Stuart Townend, Brenton Brown, Darlene Zschech, Kevin Prosch, Brian Doerksen, Reuben Morgan and many others. Churches and small groups without musicians who would still like to sing contemporary music. Also great for churches when musicians are away. We've made it really easy. If you can use a DVD player remote control, you'll have no problem with this. Very easy, logical menu screens, quick to navigate and if you don't want to jump back to the song list after each song, then simply select one of the play lists for a seamless flow of worship. Are there chord charts with the DVD? The DVD does not contain chord charts. 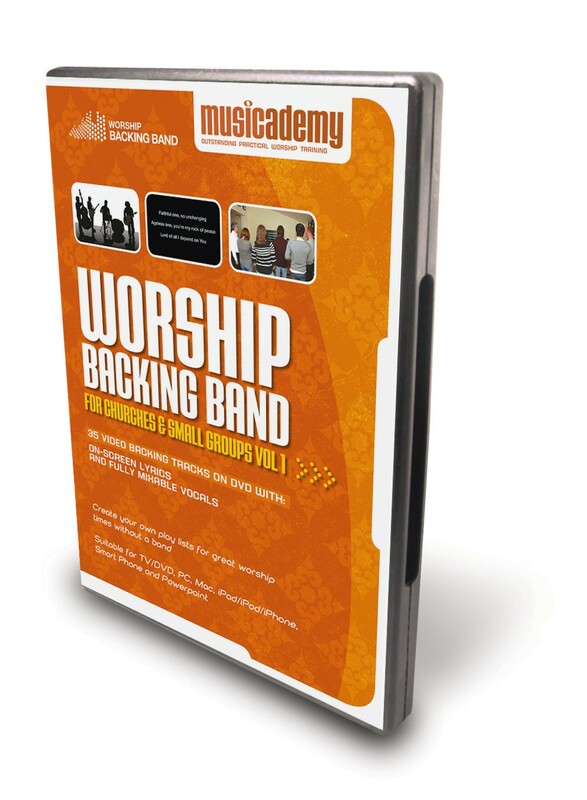 If you are a musician requiring chords then check out the other Worship Backing Band DVD called Worship Backing Band - Musicians Practice Tracks. This includes on screen chord charts to the same 54 worship songs as Worship Backing Band for Chruches. With this product you can select to take any one instrument out of the mix. So, for instance, a guitar player can take the guitar out of the mix and play along with a pro band. Will you be releasing more songs soon? Yes. We've been investing heavily in the Worship Backing Band products and in Spring 2011 will be introducing a new batch of songs together with other developments. How does licensing work for the songs if we are singing them in church? 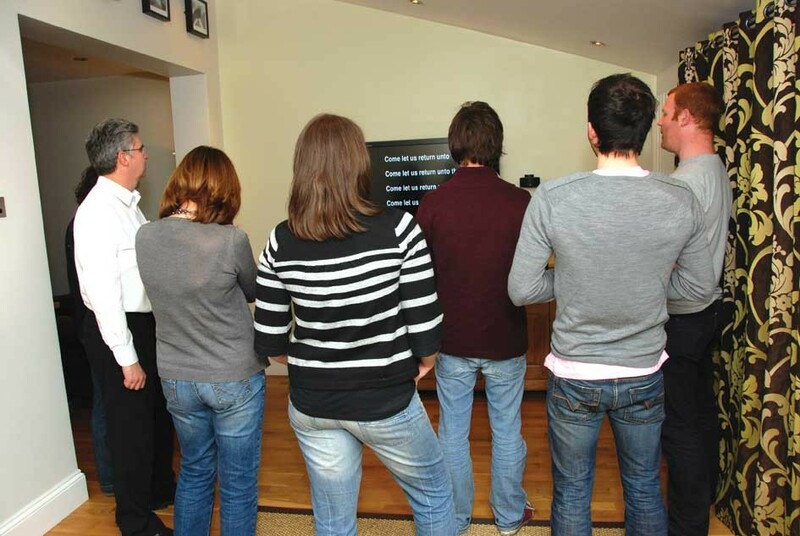 Whilst we've paid a license fee to each song publisher for the sale of the DVD, you will need to continue to do your usual CCLI reporting on any of these songs that you sing in church. What happens if we need multiple copies for housegroups? Please do not burn copies of the DVD. This is illegal and means that the appropriate licensing fees are not paid. 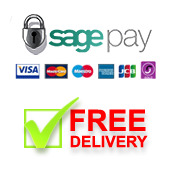 We have put some bundle packs together to enable you to purchase multiple copies at a discount. The only negative thing I can say is that folks have asked for graphics instead of just a black screen. We did extensive research on this topic and found that a lot of people found graphics very distracting. We therefore went with the plain background. Churches that want graphics can still use platforms such as EasyWorship alongside our DVDs and Split Tracks. I use this dvd for worship at my ministry outreaches. The first time I used it the people attending the outreach sang as though God had sent His own choir. I have never seen this happen before at our outreach before. looking forward to Vol. 2. maybe on the dvd itself there should be a way to turn down the lead vocals a little as an optional feature that would work on a dvd player. i use a vocalstar DVD player and would love to have an option as above. not eleminating vocals but just turning them down. But yeah, this is the best product I've ever come across. maybe a Vol. 3, 4, and 5 ? Again, awesome job to the musicians/vocals on Vol. 1.- very professional!!!!!! That feature and more besides is available on volume 2. We had finally got a guy for worship and God is soooo faithful. When he was slated to play worship his job's schedule changed from Sunday through Thursday day shift. Obviously we no longer have live Sunday worship. I ordered this as soon as we found out. My congregation calls me a "worship snob" (lovingly) for I held out for live worship and it is still at bay. We fired it up three weeks ago and have not flinched. We had a fellow Believer in our group lost a family member the week prior to last and he had come to church. I saw him sitting on his chair hands turned upward from his legs and he praising God for we had played a somber set from the pre selected tunes. You have a reformed "worship snob" with that story alone. This is a viable product and has helped us fill the worship need of the flock. I am thankful that we can bring praise to our small congregation. Guys, don't be afraid to use this form of worship. It's always on time. It doesn't call in sick and it brings others into a state of worship and I believe that is key to begin the service with an acute sense of being brought into the presence of the Lord. The last church I was with had a worship team and I was on it for 11 years. We co-labored with another church who met on Saturday. They had a traditional hymn-based worship team. Their congregation gave the team a bit of pressure to be a tad more contemporary. That made for tension in the ranks. They use this same system and their is peace in the flock. This item looks just great for Small groups or Churches lacking in musicians . Brilliant great choice of Songs also. We have used this backing Disc a number of times and the congregation have enjoyed using it and also have quickly learned new songs while singing to it. The choice of songs is really good. I would like to purchase more songs in this format - older and new -even perhaps a disc of favourites from past years. The only problem we found was that some of the songs stop playing halfway through while others have been no problem. We are not sure if this is our equipment (but we don't think so) or is a fault of the duplicating process. Apart from that, it's great - and we want more to be produced! This is the first time we've heard of this problem. And we've sold a lot of these disks. Maybe your disk is faulty. Of course you can return it for a replacement if you would like. 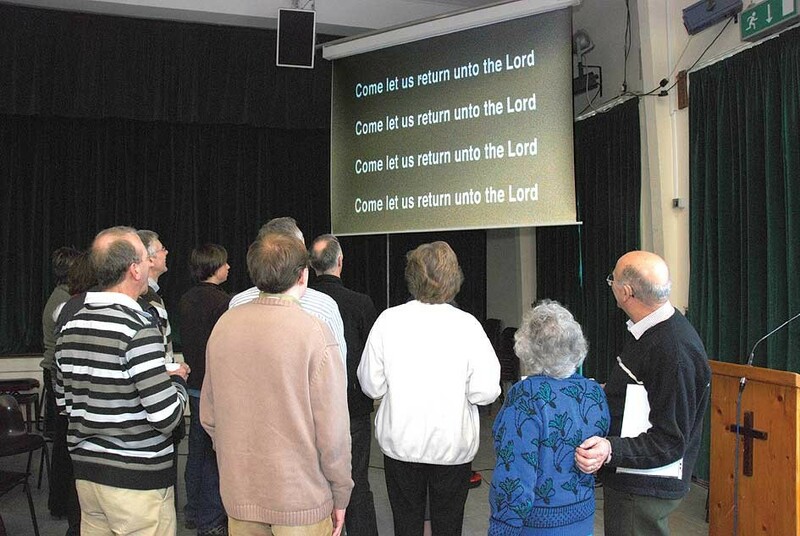 We have only used it for small group worship so far, but think it will be suitable for a full Sunday service. Some songs we are not too familier with but we can learn them by using the DVD. Two things that could perhaps improve the DVD. The background to the lyrics are a bit boring; maybe some sort of pattern could be used. Could there be some way of creating our own set list? Great value and perfect if you have no band. If you issue another selection then we would certainly be interested. Thanks for this resource. The only frustration I have had with it is the keys the songs are in. They vary hugely depending on if a female is leading the song on the DVD or a male. It would be nice if you could choose a high, medium or low range when you buy the dvd.